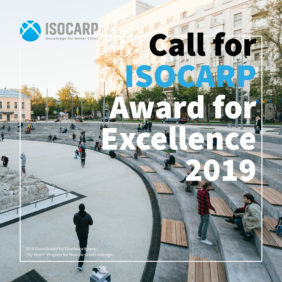 The ISOCARP Awards for Excellence, established in 2005, rewards plans in the design phase as well as projects in progress or already implemented. The Award is open to a wide range of professionals and institutions operating in the domain of urban and regional planning: architecture and/or urban planning companies; cities (public administrations and/or urban development agencies); university departments and/or research institutes; NGOs, and freelancers. The jury is composed of five ISOCARP members (experienced practitioners). The Award is bestowed in two categories: Grand Award and Merit Award. The Award winners are announced during the official ceremony at the ISOCARP annual World Planning Congress. Grand Award: one year of free membership to ISOCARP, free entrance to the Congress, official ISOCARP plaque, official ISOCARP certification of the award and dissemination of the project through the ISOCARP website, social media and newsletter. Merit Award: free entrance to the congress, official ISOCARP plaque, official ISOCARP certification of the award, and dissemination of the project through the ISOCARP website, social media and newsletter. ISOCARP Institutional Member: 500 Euros for each entry (a candidate can apply with multiple proposals). Non-ISOCARP Institutional Member: 1500 Euros for each entry (a candidate can apply with multiple proposals). NB: By submitting an entry, an applicant can apply to get one year of free ISOCARP Institutional Membership. Please submit your 2019 Awards for Excellence entry online.